When we launched Civitas Social Housing Real Estate Investment Trust (REIT) on the London Stock Exchange in November last year, we hoped to bring together long-term investors with the social housing sector and offer new alternatives that worked economically and socially. We were proud that investors supported our vision for the first social housing REIT, and its £350m listing was oversubscribed. It is also encouraging to see that our work has inspired others and a valuable new funding mechanism for social housing has emerged. This greater investment capacity can be used to help solve some of the major challenges the sector faces. While money is of course important, it’s how it is invested that counts. Civitas Social Housing commits to providing capital investment over the long term, reflecting the needs of our partner housing associations and their tenants. Our experience has shown that being able to offer long-term solutions is particularly relevant for specialist supported housing. Since our launch, we have moved quickly to develop a diversified portfolio of social homes across England and Wales. To date we have invested around £284m (before purchase costs) in acquiring 282 properties across 82 local authorities, with 1,820 underlying tenancies supported by 10 housing associations and 50 care providers. We also set ourselves a target to invest the capital that investors – including local authority pension funds – had provided to us within a year, and we are currently well on target to achieve this. For every purchase we make, we undertake a detailed schedule of due diligence. We are always very conscious that we are managing money for investors large and small and striving for a social impact as well as an economic return. So what is next in ensuring new sources of funding continue to make this social impact? 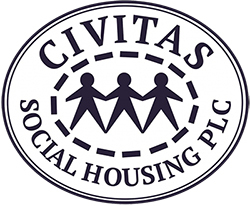 For our part at Civitas Social Housing, we remain committed to building a large, diversified portfolio of social homes and entering new areas of the social housing sector. We will also continue to expand within specialist supported housing. This reflects the fact that in UK housing today there is an increasing need for specialist accommodation that assists those with a long-term dependency. For example, we can free up NHS beds being used by individuals who are still in need of support, but not within a hospital environment. There is also the growing issue of homelessness across many parts of the country. We were very pleased to have the opportunity to agree a partnership with homelessness charity Crisis to support its Renting Ready programme around the country. But this is only the beginning. We are exploring other partnerships, beyond our regular investing activities, that will enable us to contribute further towards tackling homelessness. It’s also important to raise the standard of homes within the sector. We have so far facilitated more than £10m of improvements to the properties we have acquired, in order to ensure our homes are suitable to the needs of tenants. This sits firmly within our objective to act as a catalyst to bring additional capital and homes into the regulated social housing sector. This extra capacity means better homes and, most importantly, better outcomes for tenants.